The aforementioned Home Theater, operated by the family of Werner in what is today Fisher & Company Clothiers on West Main Street. The theater closed sometime during the 1930s. 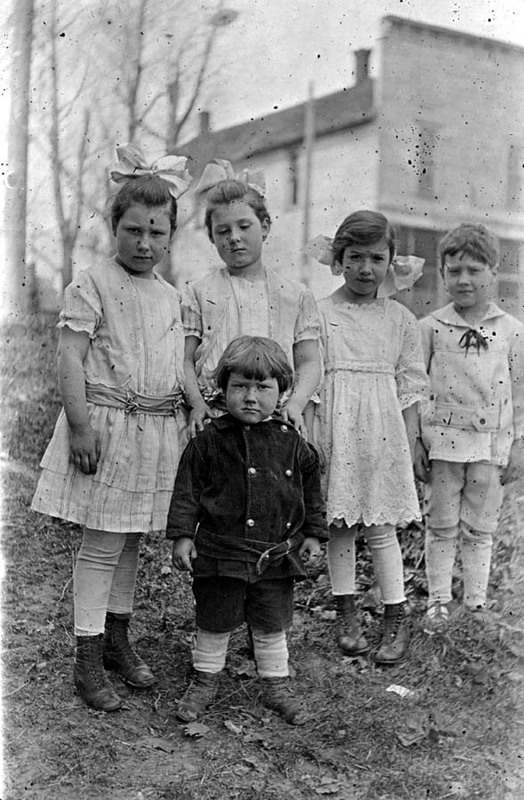 The Werner children in 1917 on Main Street in Culver. Behind them is probably Werner's original shop on the east side of Main Street, just south of the hardware store. Lessie Elizabeth Taylor Werner, H.L. 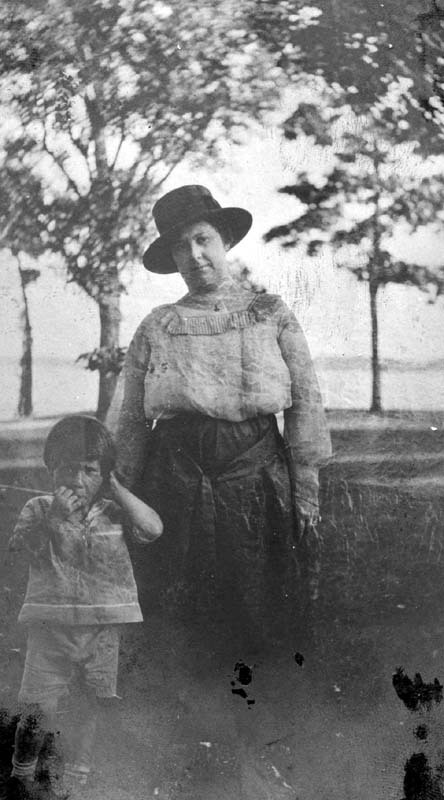 Werner's wife, is seen here with son John in front of Lake Maxinkuckee in 1919. 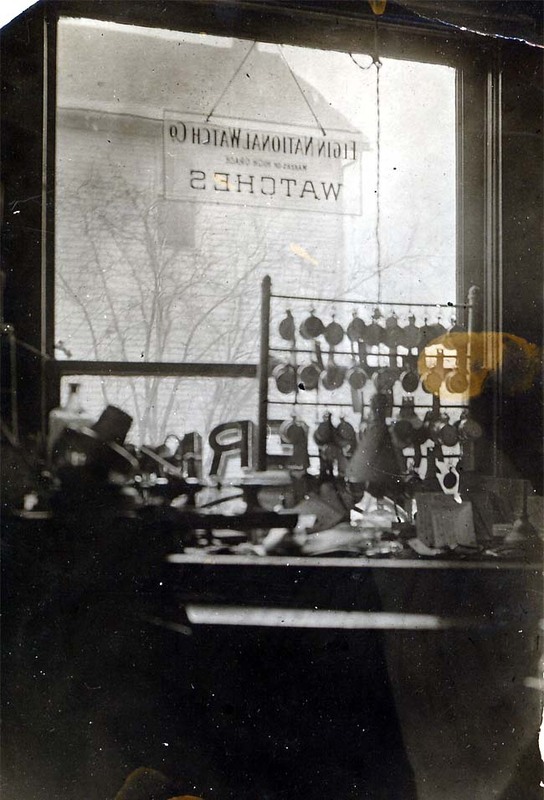 View out the window of the Main St. shop of Harold Werner, watchmaker (this photo was taken from Werner's west-side of Main Street shop on the second floor, facing east). 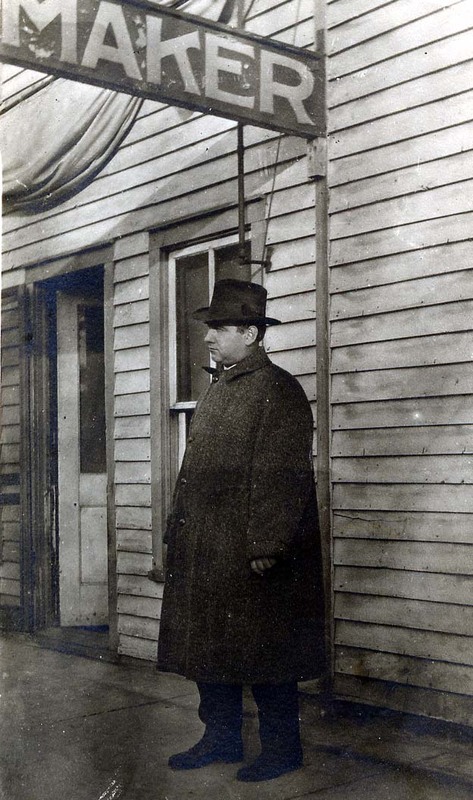 Harold Werner in front of his Main St. shop while still located on the east side of the street. 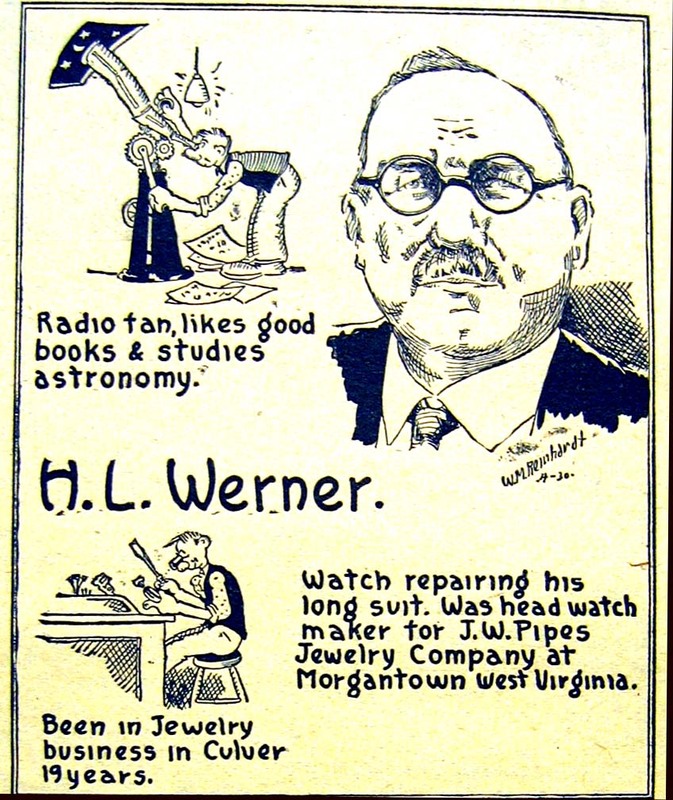 A 1939 Culver Citizen profile of local Jeweler H.L. 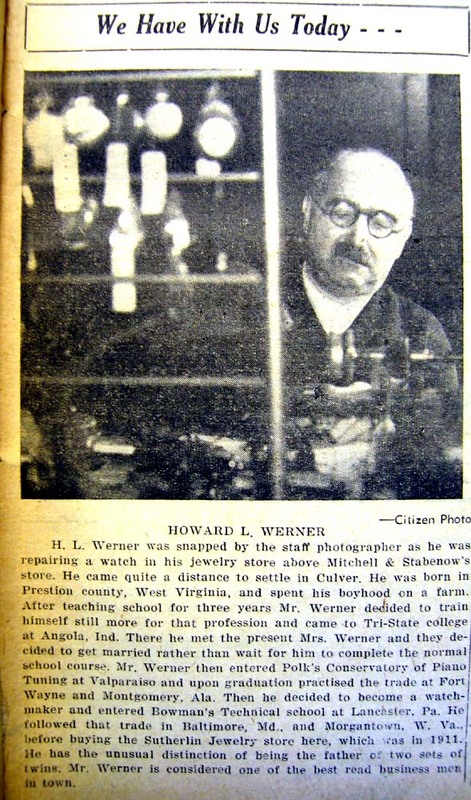 Werner, one of the better-known businessmen of Culver for many years. 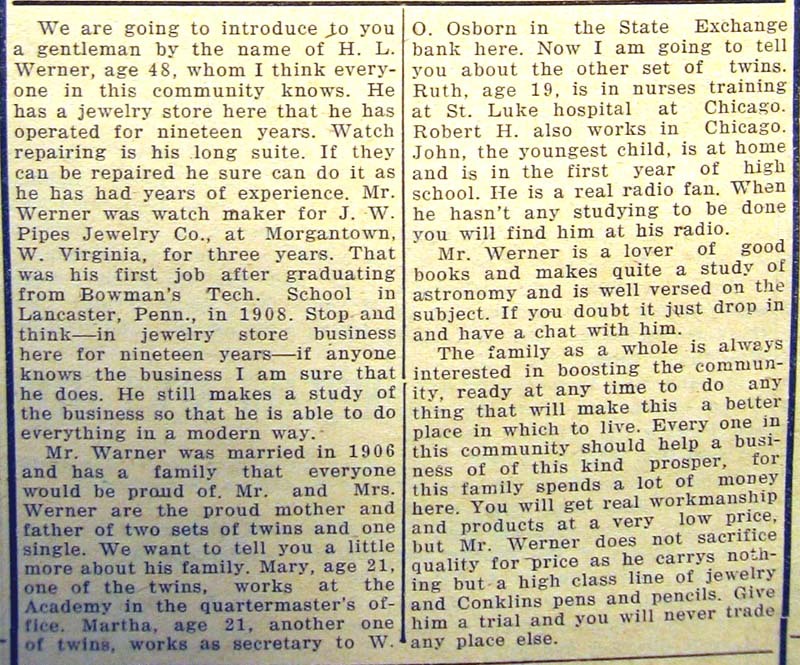 This feature was one of a series the newspaper ran in 1939, profiling local businessmen. Harold Luke ("H.L.") 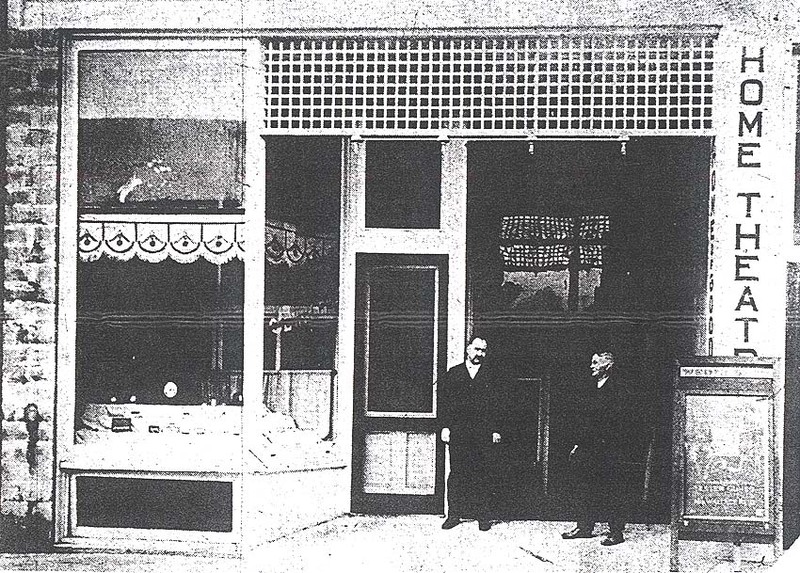 Werner moved to Culver around 1911 from East Virginia and set up his jewelry repair and watch-making business on the east side of Main Street, though he eventually moved it to an upstairs location on the west side above today's Fisher & Co. clothiers. He and wife Lessie Taylor Werner had five children: Bob, John, Martha, Mary, and Ruth. H.L. Werner died on April 6, 1954. Above: H.L. 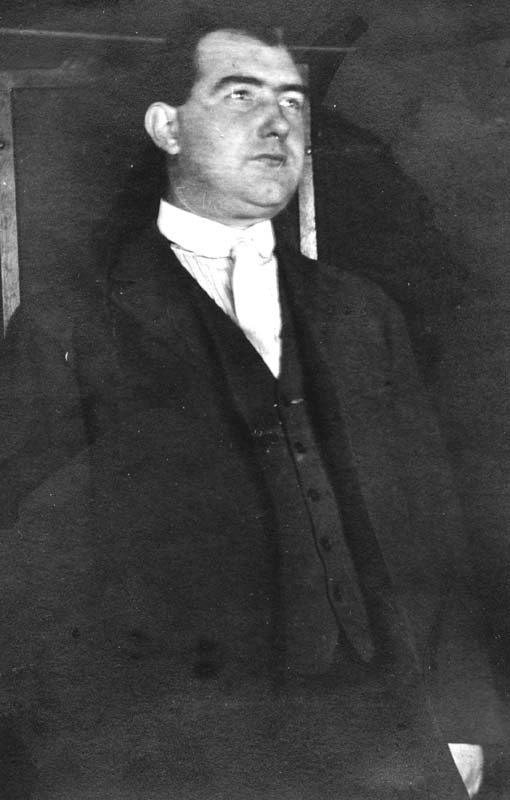 Werner in 1919 at age 37. "The result of this report was that my Father came by himself to Culver on the railroad to take a look at the store and the town. Apparently he did not like what he saw, even after he talked with the local banker, a Mr. Schuyler Schilling and several other people including, of course, the owner of the store, a Mr. Sutherlin. Dad returned to the Culver railroad station to wait for a train to take him to LaPaz, Indiana where he could get the return train to Morgantown, West Virginia on the Baltimore and Ohio Railroad. However, while he was waiting at the Vandalia Railroad Station, Mr. Schilling found him and talked my Dad into buying the Jewelry Store, probably with a generous financing plan. I have no idea how much my father paid for the store, how much he financed, or what (if any) deal was struck, but Mr. Schilling did talk Dad into moving to Culver, Indiana in 1911 with my mother and all four of their little babies. They lived in Culver the balance of their lives." "...Along about 1920 or 1921 my father decided it was time for a change to improve his business. To this end he rented a small store across the street in the next block which was in the actual "business district" in Culver. The store that he rented was one-half of a standard sized store and actually consisted of about one-half of the front entrance of a theater that Mr. John Osborn was opening. This theater was built backwards with the screen in the front near the entrance and showed silent films only, since talking pictures had not yet been invented. John Osborn also owned three other two story buildings adjacent to the one that was converted into my Dad's new store and the theater. The apartment above the theater also became available a few weeks later since Mr. Otto Stabenow, who was half owner of a clothing store next door, was building himself a new home and was moving out. Pop rented the apartment and we moved in as soon as possible. It was much bigger than the old house we had been living in and consisted of three bedrooms, a dining room, two living rooms, a kitchen, and a bathroom with a tub and sink as well as the usual necessity. The front looked down to Main street and the back onto a large porch with steps down to the alley. There was also a ladder going from the back porch up to the almost flat roof of the apartment, and this proved to be very handy a few years later when I became interested in radio and wanted to put up antennae on the roof. Pop paid $35 a month rent for the store alone and had to furnish his own heat by installing a large furnace in the basement. This furnace also heated our apartment by means of a large duct in the back of the store that went straight up from the furnace in the basement. He also paid $15 a month rent for the apartment, making the total new rent now $50 a month compared to $10 a month which he was paying before. Living in the apartment was much better, and we even had doors on each bedroom for privacy. We also had a kitchen that was not part of the dining room. We were living in the lap of luxury. The new store allowed Dad to have a show window on the street, and Mom always enjoyed fixing the display of jewelry in the window. Dad also had a clock, which was linked to the Naval Observatory by Western Union, in the window display. Dad stayed in this same location for many years, some good and some lean until Mr. Osborn decided to enlarge the front of his theater to make it look like a conventional theater. He had already reversed the screen to the back where it should have been all the time. To make this screen shift meant that we lost about three fourths of our back porch, but we didn't mind since the projection booth was now just outside our back door. Bob and I found the projection booth to be a very interesting place. When Mr. Osborn enlarged the front of his theater he rented about a third of the apartment next to our apartment to Dad for his store. Memoirs of One John Edward Werner - the full-text book, written by H.L. Werner's son, online.